It is fairly well known that I love my shed. 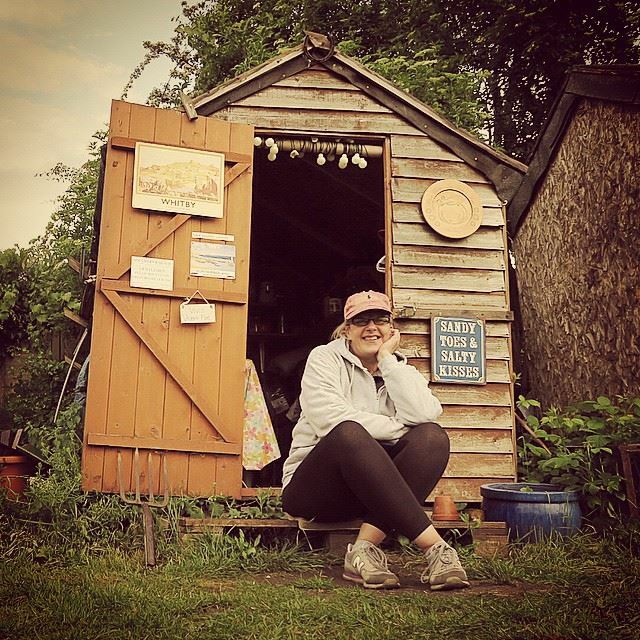 Sheds, one could argue, are the epitome of British allotment life…….as we travel through the ‘burbs on our commuter trains we see the allotments……and then we see the sheds; neat and tidy or ramshackle, Heath-Robinsonesque structures that even Robinson Crusoe would be proud to call home. These little structures give shelter to our most prized tools: our spades and forks, our riddles and assorted pots and trays…..they house our battered old biscuit tins full of seeds and our other biscuit tins full of, well, biscuits. Sometimes our sheds are big enough for a chair…..and we dash to them for shelter from the unpredictable British weather. Some of them are so tiny it takes a planning committee to get a trowel into them. So m uch is our obsession with our sheds we even have a national, televised competition devoted to them. But our sheds are so much more than store-houses for our tools and teabags. They are sanctuaries, a ‘room of one’s own’, far away from the madding crowds. The beauty of the shed (or mine at least) is that there are no phone cables, no computers, no emails…….my shed is silent. Silent….but for the creaking floor and the hiss of the gas as it boils the kettle. Some people spend a small fortune on a foreign holiday to ‘get away from it all’…..I go to my shed…..for free. I sit in my shed alone…and dream. Sometimes I read. Sometimes I fill my shed with friends and drink tea and dunk biscuits until the sun goes down…..but mostly I just sit….and listen to the quiet. I’m planning on building a new shed this year and I can’t wait. In my mind it will be something between a mountain cabin and a beach hut….in truth it will probably look more like Mr Crusoe’s hide-out. No matter. It will be a room of my own. But you’re all invited of course. Previous post: This too shall pass…. Thanks for the invite. Anew shed is so exciting. Whatever it is, it looks very practical and charming. It was inherited……and it was in a bit of a state back then. It has served me very well but it’s time to be water proof again!